Your phone goes off and a quick glance at the clock reveals it is 2am on Saturday morning. The team pushed out a new software release on Friday afternoon and now all Hell is breaking loose. You stagger to your computer, log in, and realize this isn’t going to be a quick fix. You immediately start tracking down the operations and development team members (good luck finding them over the weekend) needed to debug and get things back up and running. Meanwhile, a lot of angry customers whose own businesses are being impacted are left to wait and wonder when things will be working once again. Hopefully it will take a few minutes, but far too often it takes hours or days. Just as your company should be looking to become nimbler and innovate faster, the hangover of these processes actually begins to impact software release cycles as parts of the organization become reluctant to push out new code. Alternatively, perhaps your company has increased the velocity of software releases through processes like continuous deployment but is now beginning to show the significant strains associated with an accelerating number of production issues. Either way, your company struggles to innovate as fast as it would like and to deliver a high-level of customer satisfaction. Scenarios like this play out over and over again for companies all around the world. Enter Edith Harbaugh and John Kodumal. Edith and John lived this problem at their respective employers and set out to do something about it. In 2014, they started LaunchDarkly to help companies eliminate risk from the software development cycle. To make this happen, they created a feature management platform which gives developers and operations teams control over software even after it has been deployed. The product allows companies to wrap new code with feature flags. These flags can be turned off and on through the push of a button. So now when the phone rings at 2am on Saturday, your team can simply turn off the new code and return to the previous stable state. Your customers can be back up and running without disruption while you debug the code. What’s more, with LaunchDarkly, you can do fine-grained releases to a percent of your user base or even to individual users based on a range of attributes. 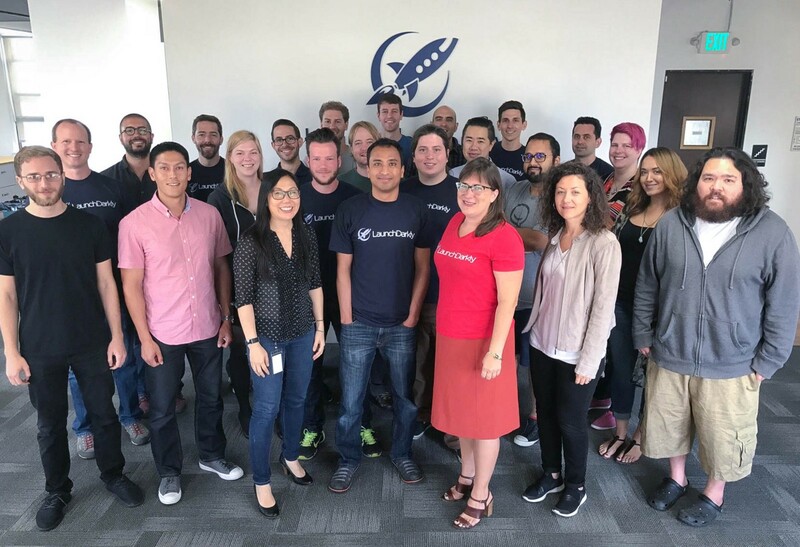 We have been watching LaunchDarkly’s success for some time and are very happy to announce that we recently led their Series B financing. The company’s story has resonated with customers of all shapes and sizes such as Microsoft, Atlassian, CircleCI and GoPro, and LaunchDarkly is currently serving billions of feature requests daily. When we talked with their customers we were struck by the far-reaching impact of their feature management platform. Engineering teams love it because they can move faster. Operations teams love it because it gives them control. Increasingly, product managers are realizing the potential for the platform to change how they think about product management and product roadmaps (more on that later). Most strikingly, CEOs talked about how LaunchDarkly was changing how they thought about their businesses. The feature management platform was helping them become the nimble organization they hoped to be. We are thrilled to be working with two world-class entrepreneurs in Edith and John and can’t wait to see the full impact of feature management as the market develops. And, for those of you who get the call at 2am, we hope this helps you get back to bed faster.